The tony getaway options made an early-August debut at the Carmel Valley getaway. 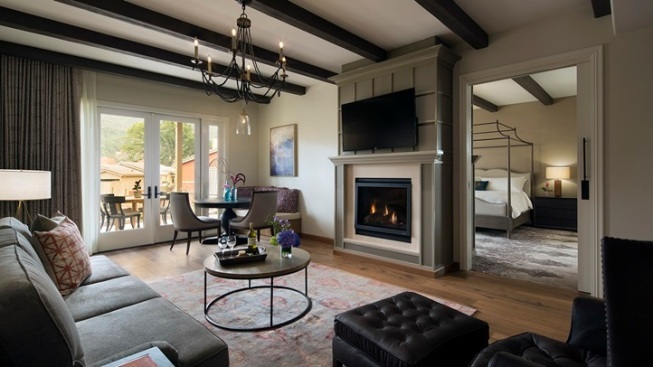 Following a 2015 renovation, the Carmel Valley property recently unveiled 14 new ultra-luxe villas and suites. SOMETHING SPECIAL: Treating your nearest/dearest to a surprise weekend away for an anniversary or birthday or a just-because-ery takes some crafty planning, the ability to not spill the beans at inopportune moments, and a sparkly sense of the splurge. If you're going to do it up, you want to do it up on the fancy side, but if your flavor of fancy is more about a rustic setting, rather than city lights, look to a batch of new villas and suites in Carmel Valley. THE 14 FRESH ADDITIONS... to Bernardus Lodge & Spa were unofficially unveiled in the early part of August 2016, following a renovation of the hotel's rooms and public spaces in 2015. This is property that rambles over 28 acres, acres that encompass wine-nice vines, fragrant lavender, and the sort tawny, hill-rolling loveliness the region is famous for. So to walk your sweetheart up to a "ranch-chic" suite in this singular setting could be accurately considered highly birthday-worthy. BUTLER SERVICES... during your villa or suite stay, as well as use of a Mercedes Benz convertible (that's gratis, with no fee on top). Is there a private rain shower outside, the better to soak up some of that soft Carmel-y sunshine while you bath? There shall be. If you need anything for your room, or suggestions on sightseeing, or a dinner reservation, will that be difficult to obtain? The staff-to-guest ratio is an impressive 3-to-1. To get started on your sweetheart's surprise weekend, and to snag a peek at these pretty new spots dotting the property, begin here, luxe-minded road-trippers.